Noblemania: Bring back the Sea World superheroes poster! 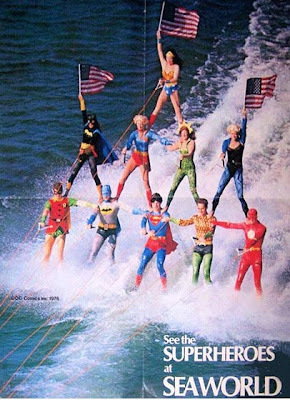 In early 2010, I began to track down a bunch of former Sea World water skiing superheroes to interview them; I ultimately found more than 40, including seven of the ten in the famous poster above. Not long after, I began thinking "reunion." Lest there be any misconception, I was not one of them, so I was not doing this for my own benefit, but I sure would love to see it happen on their account. And sure enough, some of them had the same idea and have something in the works for fall 2012. However, the kind of reunion I had in mind was not only a personal one but also a promotional one at a comic book convention. Because one of the two Sea World locations that featured the superheroes show was Orlando, and because many of these former show skiers still live in that area, it would seem that the best candidate to host such a reunion is MegaCon. While speaking with MegaCon's head organizer, who seems open to the idea if circumstances allow, we came to the possibility of reprinting the poster, most likely with one small addition (MegaCon logo?) to distinguish it from the original, and distributing it for free at the convention at which skiers appear. This poster was not published by DC Comics and does not feature DC licensed art, so I was hoping/expecting that the only real hurdle would be securing Sea World's approval. Sea World said yes if DC did, but because of unspecified legal factors, DC said no. As you might have guessed, I appealed. DC (nicely) said no again. The poster has something of a cult following among DC fans and offering a "retro" version in a controlled environment seems consistent with many other reissues and "nostalgia products" DC has approved; one example is the Retro-Action line of DC poseable figures (done in the style of the beloved Mego figures of the '70s), though they are, of course, sold rather than given away. I think the buzz that reprinting this poster would generate would make whatever obstacles may be present worth surmounting. Posted 7:09 AM Labels pop culture nostalgia, public pitch, Sea World, series: Super '70s and '80s, they said no, where are they now?